Greetings Travelogue-ers! Sorry it’s been so long since my last update. Classes are finally fully underway and it feels like I’m finally starting to get the hang of everything. I’ve also spent a lot of time planning trips around Europe, which has been really exciting (and expensive…) for me so far! I was thinking of what to write about this time, and settled on the thing that has surprised me most about Copenhagen so far. Coincidentally, the topic is also one of my favorite things on the planet…food. I have come to learn that Denmark is not a place you should visit for the food. It doesn’t boast world-renowned pasta like the Italy or delicious tapas like Spain. While Denmark is home to Noma, the restaurant frequently voted the best in the world, I have found that the average visitor or resident here is deprived of food that you would describe as traditionally Danish. I am sure this is due in part to how expensive the city is, as only very wealthy families go out to eat and those restaurants might be where most Scandinavian cuisine is hiding. Alas, this has meant that I have been cooking for myself quite frequently and getting takeout sometimes as well. After already completing two years at Richmond, I have to say I was surprised I yet to feel the quintessential pressure to survive on Easy Mac and Ramen Noodles that so many associate with their college years. Perhaps it’s because I’ve always lived a convenient distance from D-Hall that I’ve always found myself eating fairly diverse and well-balanced meals in my time as a university student. Or maybe it’s because of my fondness for Lou’s salads, it’s hard to say. One thing that is clear though is that that trend has not followed me across the pond to Denmark nor have I had much chance to try much Danish food. I came to Denmark and am finally eating like a college student. This being said, I have tried to actively seek out Danish meals to help broaden my understanding of the culture here. 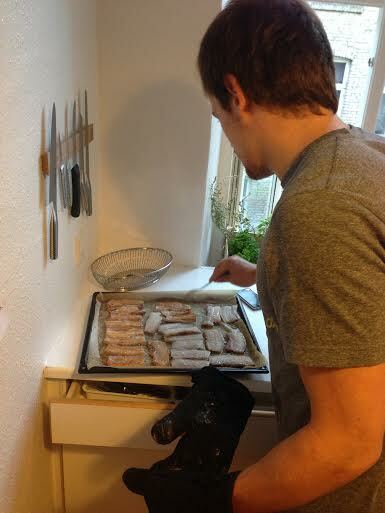 My first experience was when my CBS buddy invited me to his apartment to cook some authentic Danish food. We started out by walking downstairs from his apartment to the grocery store, and I mean “downstairs” very literally. The closest supermarket was just steps from the door of his apartment. That’s another thing about Copenhagen—there are grocery stores everywhere. While each is much smaller than the ones we have in the States, they are much more abundant here in Denmark. I can’t say which I prefer yet to be honest, but it is remarkably convenient to have four stores within seven minutes walking from my dorm. 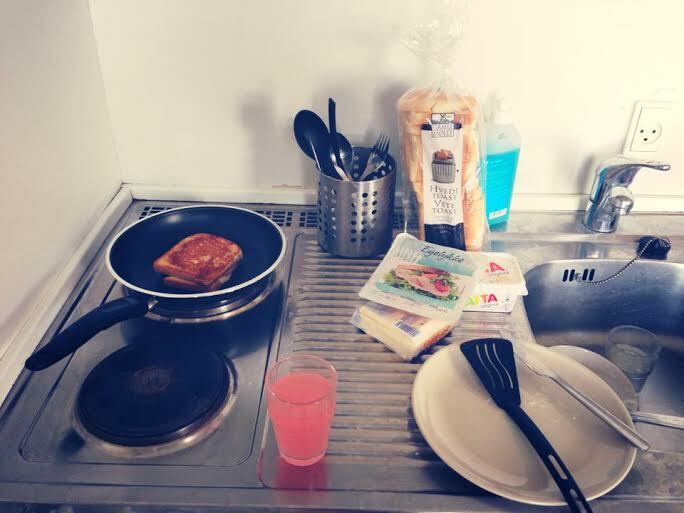 Even though my buddy Kristoffer and his apartment-mates wouldn’t let me help, I sat back and took mental notes on how they were preparing the food should I ever want to be adventurous and give it a go myself. They started by boiling the potatoes, which I am fully confident in my ability to do, and making the parsley sauce (basically a gravy). The sauce itself probably made me gain ten pounds as it was comprised exclusively of some parsley and lots of butter, flour, and milk. Parts of each were added in increments while constantly stirring the mixture at a light boil. The parsley was added at the end, which not only added flavor but also made the sauce speckled green in a pretty way. Then came the meat to prepare, and I learned I was foolish to think the gravy was to be the thing to make my pants tighter. The meat was described to me as more thickly cut bacon (imagine my excitement), and they cooked it in the oven on moderate heat and flipped it to brown both sides. They made sure to cook some pieces more thoroughly than others since people have different preferences on how well-done they like the slices. I think I preferred the crispier pieces but I’m not opposed to giving the others a second audition. We sat down to eat, drowned the meat and potatoes in gravy and served it with a side of beets, a food that I’ve always surprised myself by loving. It was a great meal and I thank those guys not only for welcoming me into their apartment but also for sharing some of their culture with me. Frederik, one of Kristoffer’s apartment-mates, also gave me some insight on my aforementioned observation of the lack of traditional Danish food. The final product! 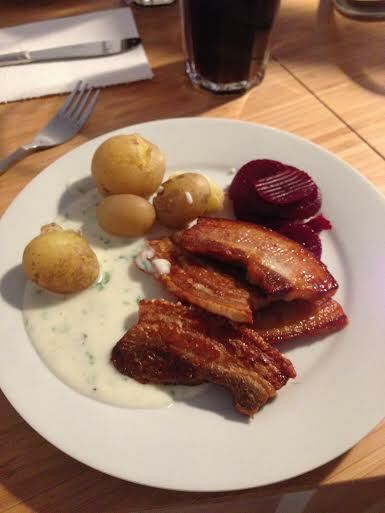 One of the most traditional Danish dishes called stegt flæsk med persillesovs. It was clear the meal before us was hearty and, while delicious, full of fat. He explained that dishes like these were what Danes typically ate back when Denmark was an agricultural country and the farmers needed a hefty supply of fuel to work in the fields all day. Since the country has evolved away from this physically strenuous agriculture, the people could no longer consume the same food and lead a healthy lifestyle. I found this description fascinating because of how a simple shift in the occupational norm could affect food, something integral to a nation’s culture, with such magnitude. Hopefully I will be successful in tracking down some more Danish dishes, but until then I might venture to cook some more elaborate things myself. This entry was posted on Thursday, September 18th, 2014 at 3:46 pm and is filed under Diana in Denmark, Fall 2014. You can follow any responses to this entry through the RSS 2.0 feed. You can leave a response, or trackback from your own site.